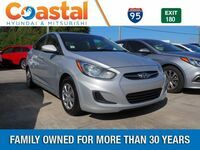 The fifth-generation 2018 Hyundai Accent has arrived here at Coastal Hyundai in Melbourne, FL, and we can honestly say that it is better than ever. Now, some people may be upset that the new Hyundai Accent lineup no longer offers a hatchback model option, but we’re here to tell you that the 2018 Accent lineup has received so many impressive new upgrades that you won’t even notice it now only offers sedans. One of the most impressive improvements made to the 2018 Hyundai Accent lineup is found under the hood. That’s where you’ll find the newly enhanced 1.6-liter DOHC 16-valve transverse-mounted Inline 4-cylinder engine that powers the lineup. This updated powertrain features Gasoline Direct Injection capabilities and offers you the choice between a six-speed manual transmission and a six-speed automatic transmission. The new power ratings for this new powertrain are 130 horsepower and 119 pound-feet of torque – which is quite powerful when compared to the rest of its class. Its fuel efficiency is also off the charts, getting gas mileage ratings of up to 28 city MPG and 37 highway MPG with the manual transmission, and 28 city MPG and 38 highway MPG with the automatic transmission. How Does the 2018 Hyundai Accent Improve Upon the 2017 Accent Lineup? As we mentioned above, the 2018 Hyundai Accent lineup is more powerful, more efficient, and far more feature-filled than the 2017 Hyundai Accent lineup that came before. We already told you about the updated engine and powertrain features, so let’s now check out some of the other improvements made to the lineup. For starters, the 2018 Hyundai Accent lineup now features a more sophisticated and stylish design, complete with a new cascading grille, projector headlights, LED daytime running lights, LED tail lights, fog lights, a power sunroof, a segment first hands-free trunk and 17-inch alloy wheels. This luxurious style continues inside, where the new Accent lineup features segment first dual USB charging ports, heated front seats, automatic temperature control, proximity push button start capabilities, and more space than ever before. And, no, that’s not hyperbole. The Hyundai Accent has always been classified as a subcompact car, but thanks to its increased passenger volume, the EPA has had to classify the 2018 Accent lineup as a compact car. That’s right, there’s so much additional room inside the 2018 Accent that it had to jump up a segment. For more on the 2018 Hyundai Accent, please contact our friendly Coastal Hyundai staff in Melbourne, FL.